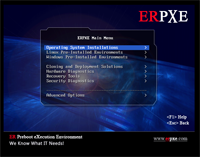 We evolve with the community and try to provide a solution for every PXE involved issue. Please check our Wiki or write a post on the Community Forum before contacting us. If you’re part of the ERPXE developing team, or would like to be updated – you can send mail to join the mailing list – erpxe@librelist.com. Copyright © 2019 ERPXE. All Rights Reserved.